A decade starting from COP21 would be a major turning point for global civilisation facing an emergency where human survival is threatened. The Asian region continues to develop as a result of economic growth, and if current trends continue, GHG from this region are expected to comprise half of all global emissions in 2050. In this regard, it is impossible to bring about global and historical transition unless Asia tackles it seriously. In fact, Asia could leapfrog and become the region leading the world by moving forward with the creation of low-carbon societies with our gaze fixed properly on the future. The Low Carbon Asia Research Network (LoCARNet) has been developing a book entitled “Enabling Asia to Stabilise the Climate” as a joint project with like-minded researchers in Asia who work for low-carbon development in this region. On the occasion of COP21, we would like to launch the book at a side-event at the Japan pavilion, to give a message from Asia to the world. The book contains the following contents: the first part of the book mentions that Asia holds the key to global climate stabilisation, and there is enough potential for Asia to develop while decreasing GHG emissions, by presenting research results conducted by AIM model researchers in Asia. The second part, of this book shows some cases whereby modeling results are applied to low-carbon development policies in both national and local revels respectively in an effective manner. Then, in the third part, the book shows a couple of good practices that have been conducted so far, on how low-carbon development activities and measures could address barriers in each major policy fields to implement potential reduction into the real. This side-event aims to demonstrate on how Asian countries endeavour to build low-carbon societies, and to further promote global cooperation towards realising low-carbon societies. The worldwide transition to low-carbon societies is a massive undertaking and it is up to each Asian country to set a vision for future society. Therefore, each country needs to form policies for national and local development by utilising its in-country knowledge without relying on others. It is necessary for each country to understand its specific situation and explore a future vision with the citizens who love their own country, with their full ownership. This is a historical challenge that Asia is facing and, at the same time, it is a perfect opportunity for Asian countries to lead the development of a low-carbon world. Japan has been conducting substantial international cooperation with Asian nations contributing to GHG reduction for approximately 20 years. First of all, Prof. P.R. 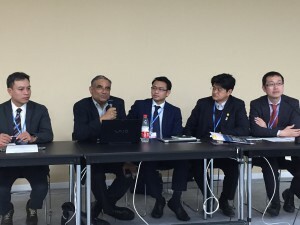 Shukla overviewed the book “Enabling Asia to Stabilise the Climate”. 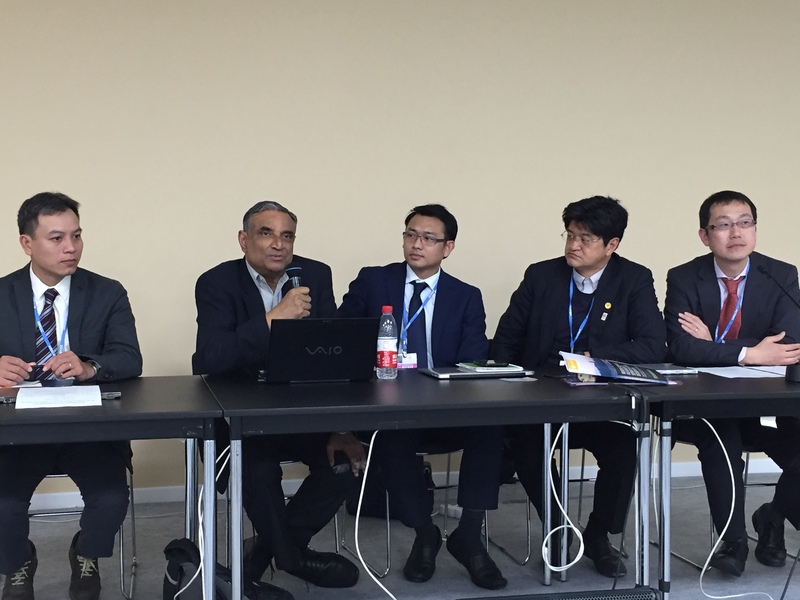 Prof. Shukla mentioned that this book aims to outline the challenges faced by each Asian country on how they are progressing in building up low-carbon societies, and it aims to share information with other countries in the region and the rest of the world. He stressed that, by doing so, global cooperation for developing low-carbon societies can be further promoted. This book was written by experts and researchers who are making serious efforts to realise low-carbon development in Asia. Following Prof. Shukla’s overall presentation, a couple of the authors briefly explained the contents of the book. The first part of this book clarifies that Asia holds the key to worldwide climate stabilisation, and examines model analyses of China, India, Japan, Viet Nam, and Asia as a whole, showing that there is large scope for achieving development while reducing GHG emissions. Dr. Nguyen Tung Lam from Viet Nam outlined his model analysis. The second part introduces good practices showing how the results of the examination of model analyses are actually incorporated into national and local-level low-carbon development policies and how they effectively work for policy formulation. Prof. Ho Chin Siong from Malaysia mentioned that results from the model analysis were applied as a scenario in the development of a low-carbon society in Iskandar. Urban population is expected to account for 70–80% of the worldwide population within this century. Therefore, it is likely that urban areas will take a front-line role in the formulation of low-carbon societies. He stressed that the example of Iskandar shows one good practice in low-carbon society formulation. The third part explains how to overcome barriers to measures implemented in each country’s major policy sectors so that possible GHG emissions reduction is actually realised by utilising good practices developed so far. Here, Prof. Shukla introduced the promotion of public transportation and the formulation of compact and energy-efficient cities. Prof. Rizaldi Boer from Indonesia then highlighted the importance of forest conservation for enhancing carbon sinks and biomass energy use. Moreover, education and research communities are essential for formulating science-based policies. In this regard, Dr. Jakkanit Kananurak from Thailand introduced advanced examples which CITC has been functioning as a knowledge hub in ASEAN countries. Following this, Ms. Tomoko Ishikawa, IGES, explained about the Low Carbon Asia Research Network (LoCARNet), which fosters capacity building in Asia, facilitates discussions between policymakers and the research community, and promotes knowledge-sharing in the region by making full use of regional cooperation. To wrap-up, Dr. Shuzo Nishioka, IGES, mentioned that Japan has been conducting substantial international cooperation with Asian nations contributing to GHG reduction for approximately 20 years. However, it is high time for Asian countries to blaze a new trail towards realising low-carbon Asia under their own initiative.